In six days the New England Patriots will face the Atlanta Falcons in Super Bowl LI or Super Bowl 51, depending on your preference. The latest betting line has the Patriots as a 3-point favorite. I’m sure you’re all just dying to know my thoughts on the game but, I’ll save my prediction on the game until the end. After the game, there will be the usual barrage of posts and articles written specifically about the Super Bowl commercials, Lady Gaga’s half-time performance and a whole host of other Super Bowl post-mortem topics. But this week is Super Bowl Week. Originally just called “Media Day” it is now a week-long array of events which start tonight with each respective team meeting the media. Tickets for the Super Bowl can easily run into the thousands of dollars. Add in travel costs and it can set the average NFL fan back a nice chunk of change. Now imagine that when you get to your place in line to go into the stadium to watch the game you learn your tickets are not real. Would be quite the bummer, huh? Yes that was a massive understatement. And if this has ever happened to you, you would not be alone for one in five Americans experiences ticket fraud when buying from unofficial sources. One of the most trustworthy sources is the NFL Ticket Exchange (NFLTE), the official ticket exchange of the NFL, powered by Ticketmaster. To help educate the public about the dangers of buying tickets from the wrong sources, Ticketmaster created a Super Bowl LI outreach program geared towards ensuring that consumers have a safe and seamless ticket buying experience for the Big Game. Ticketmaster engaged with real fans to have them share their own personal stories of the pitfalls of not purchasing official verified tickets from the NFL Ticket Exchange and Ticketmaster. Below are two videos of such fans and at the end of each video, these same fans get the surprise of a lifetime. The Dougherty family – especially twins Daniel and Eian – grew up as lifelong, die-hard football fans. So, when the stars aligned to see a game for their birthday, Eian surprised Daniel with tickets. Even more special, this was going to be their first time seeing a game live together. The two brothers made a weekend out of the experience and drove for 4.5 hours to watch the game and enjoy the tailgating experience. The two went to the stadium 45 minutes before the game and walked up to the entry point, but that’s when their brothers’ weekend took a turn. 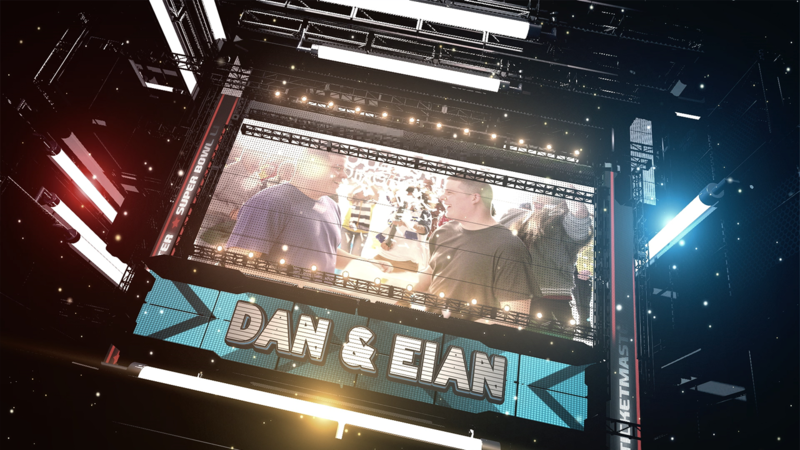 Unfortunately, Eian hadn’t bought tickets from an official source like Ticketmaster or the NFL Ticket Exchange. At the gate, the attendant told them the tickets weren’t scanning and they found out that their tickets were fraudulent. The two brothers were devastated and left the stadium to begin their trip home. They couldn’t even bring themselves to listen to the game on the radio. Because they don’t want any other fans to have this same experience, they flew to LA to share their story with Ticketmaster about the importance of buying tickets safely. About halfway through the taping, they were surprised with a letter from Ticketmaster that contained the best surprise of all…a pair of verified tickets to Super Bowl LI, courtesy of Ticketmaster and the NFL Ticket Exchange. Justin had never been to a live NFL game. To celebrate a birthday, his group of friends decided to buy tickets for a regular season game. The group opted to pair off buying tickets based on what they could find through unofficial resale sites. Justin and another girl from the group paired up to find tickets to the game as their first date. Unfortunately, Justin didn’t buy his tickets from an official source like Ticketmaster or the NFL Ticket Exchange. He found someone selling tickets to the game with what appeared to be good seats and was told they were legit. But once it came time to use the tickets, the stadium attendant at the gate told him that his tickets weren’t good. Justin was understandably upset; he’d traveled 2.5 hours and he and his date were the only ones in the group who didn’t get in. They ended up watching the game from a bar by the stadium.